The growth of the bio-economy in Europe is expected to increase pressure on natural resources. The overall goals of the RDI actions under this theme are i) to encourage the sustainable use of water resources; and ii) to safeguard water resources by reducing and limiting pollution. Agriculture is an important source of environmental pressures. 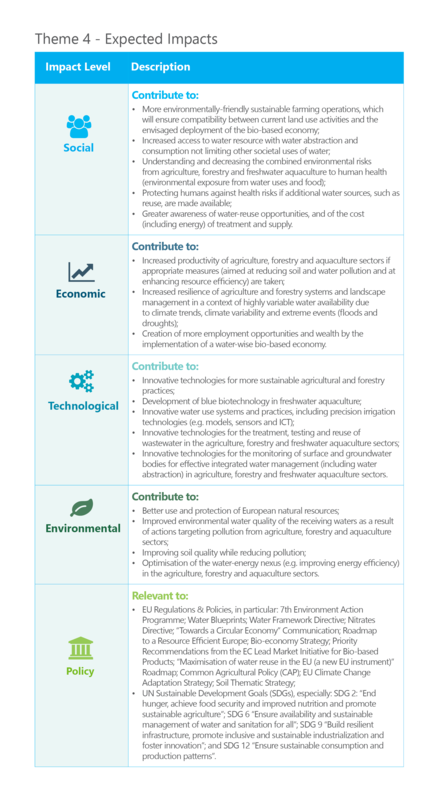 In Europe, agriculture accounts for around 33% of total water use and is the main source of nutrient pollution in water. Bio-economy refers to an economy based on the use of renewable resources from land and sea, and the conversion of these resources and waste streams into added-value products such as food, feed, bio-based products and bioenergy. One of the most likely effects of the bioeconomy is the intensification of agriculture, forestry and aquaculture with consequent pressure on natural and artificial resources (water, land and various chemicals used in agriculture). The total European bioeconomy amounts to €2.1 trillion turnover, and includes the food, feed and beverages sectors which are responsible for roughly half of the turnover. The total employment in the European bio-economy is 18.3 million employees with primary biomass production (agriculture, forestry & fishery) as the biggest contributor (58%). 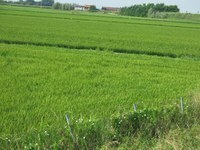 In the Water JPI SRIA, agricultural water use is considered from the point of view of natural resources, not as a production factor, covering for example, the concepts of sustainable agriculture, good agricultural practices and safe food production. Ongoing monitoring of the 2016 joint call projects. Networking workshop between the 21 2016 joint call projects and other relevant EU projects/initiatives in 2019. Synergies with other initiatives and opportunities for possible strategic and co-funding activities will be explored. These would include synergies with, for example, the FACCE JPI . The SRIA is a living document, which will be kept updated. Emerging research needs and new knowledge gaps can be submitted for inclusion in the SRIA, following review by the Advisory Boards and approval by the Governing Board. To submit your proposed addition to the SRIA, please complete the Online Template available here. The more sustainable growth of the agriculture, forestry and freshwater aquaculture sectors whilst paving the way towards job creation in all these economic areas. on the topic: Research and Innovation for Developing Technological Solutions and Services.